Speed Freeks charge the Imperial line, supported by a new xeno unit: Grot tanks. A strong and steady wind pummeled Imperial forces as they advanced down Lightning Bolt Pass, one of the larger valleys that allow passage through the Iron Spires. Fortunately, atmospheric conditions were unusually calm, sparing the troops the electrically charged phenomenon that normally endangers travelers through this region. In the pre-dawn hours of 3 670 736.M41, patrols warned of a sizable xeno force approaching from the southern end of the valley, and the commanding officer, Colonel August Klein, ordered his troops to deploy for battle. 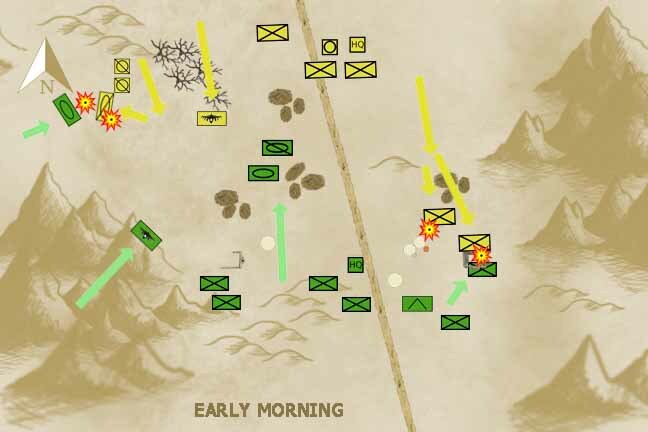 As the sun rose above the horizon, small whirlwinds (called “dust devils” by guardsmen) swirled across the no-man’s zone that divided the two enemy forces. Visibility beyond 200 meters was minimal. Hoping to disrupt the ork warlord’s plans, Colonel Kline sought to seize the initiative and force the xenos to respond to his actions. Thus he ordered a double envelopment of the ork army. Two infantry battalions were sent up the eastern edge of the valley to seize a large ruin situated on the ork right flank. 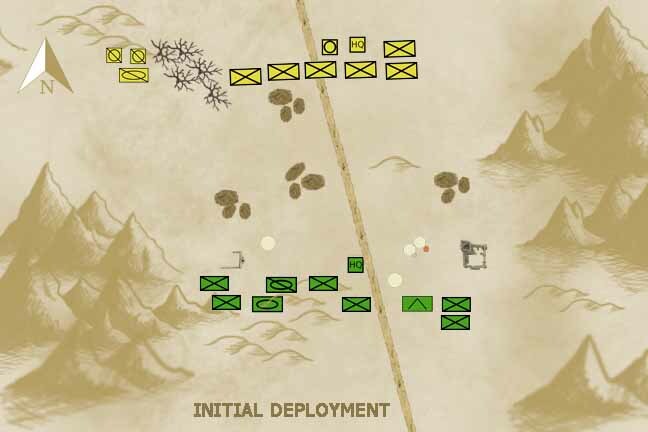 At the same time, the army commander ordered his mechanized force—the 6th Mechanized Battalion, along with his Scout Sentinels—to threaten the ork left flank. In the center, he left the bulk of his infantry to anchor a strong firing line. The speed at which these xenos raced across the battlefield suggested they were “Speed Freeks,” a designation given to orks who possess an instinctive (and somewhat suicidal) addiction to high-speed mechanized warfare. Yet these orks were cunning enough to take advantage of the the cover provided by several rock outcroppings that dotted the battlefield and blocked the Imperial line of sight. The orks were the first to open fire. Although their weaponry lacked the accuracy to be particularly dangerous, the first casualties of the battle were Imperial, with 15 casualties attributed to a single ork artillery shell that somehow managed to successfully land within Imperial lines. The orks were spared significant return fire, as Imperial forces devoted most of their energies to maneuver. On the eastern flank, the Imperial guardsmen advanced “on the run,” using an outcropping of rocks as cover as they advanced on the ruin. 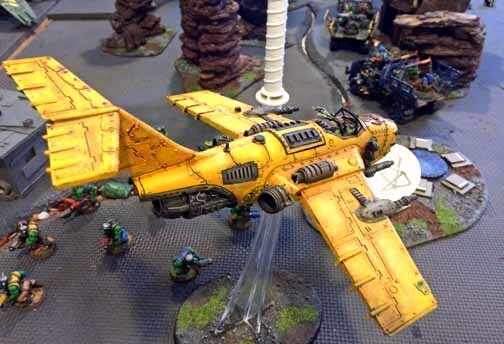 Military authorities say this bright yellow Dakkajet belongs to the orks’ only known “ace” pilot, the infamous Fast Eddy Rikken Orker. He also ordered his heavy weapons warband—his “Deff Boyz”—to target the advancing guardsmen, and their mix of xeno and human weaponry managed to inflict significant casualties on the running human troops. Despite their shorter legs, the Grots had significantly less distance to run, and so these small xenos won the race to the ruin. Deploying in cover, they opened fire as well on the advancing guardsmen, who continued to move resolutely forward. When the guardsmen reached the edge of the ruin, they revealed why their advance was so confident. Stepping from behind the front ranks, a dozen guardsmen raised flamers and engulfed the ruin in burning promethium. Scores of Grots died instantly; dozens more screamed in agony. A fresh-faced young officer, filled with righteous outrage at the xenos’ existence, raised his sword and ordered a charge. As one, the guardsmen rushed forward, slaughtering the surviving greenskins and seizing the objective. On the far flank, the 6th Mechanized Battalion advanced quickly past a petrified forest that dominated its flank, but the unit soon had to turn to their flank. Appearing from behind nearby hills, a sizable ork force—riding atop looted Imperial vehicles–charged into the mechanized guardsmen. Fortunately, the highly trained guardsmen were able to redeploy before the greenskin charge struck home, but the subsequent fighting was confused at first, with no one gaining the upper hand. At that moment, alas, a squadron of Dakkajets appeared over the the nearby mountains and dove into this confused fighting. 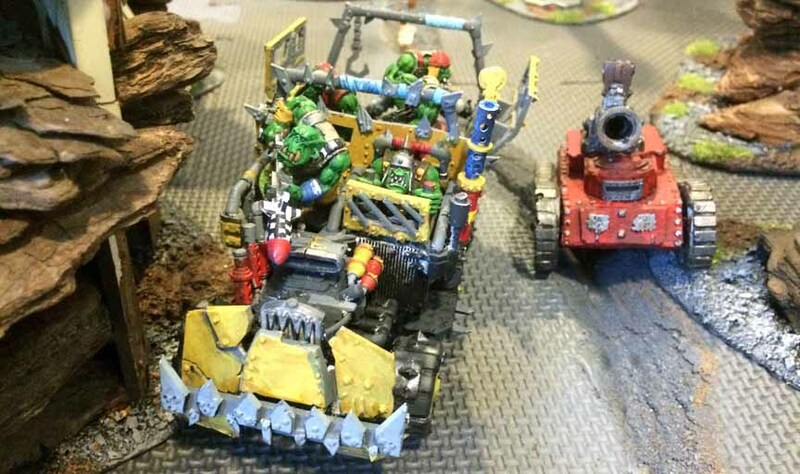 The orks’ strafing run was highly successful, as six Chimeras were disabled or destroyed, their embarked infantry scurrying out of the damaged vehicles and running for cover. But a response was on the way: A few minutes later, a squadron of Valkyrie, their passenger bays filled with the troopers of the elite 1st Veteran Company, appeared to challenge the ork aircraft. A dogfight soon erupted, although neither side was able to draw blood.